Add weight to your French verb choices without breaking your back(pack)! 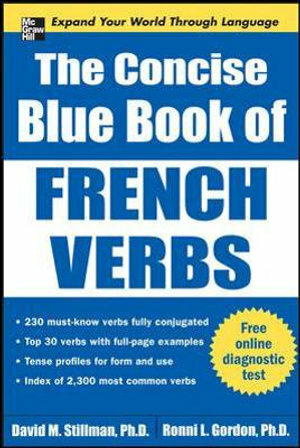 In one compact package, The Concise Blue Pocket Book of French Verbs provides 333 of the most important verbs in French in full conjugated form. Each verb is illustrated by example sentences, showing the verb in action. The top 33 verbs are broken down into groups according to key meanings, use with prepositions, and key idiomatic expressions. In addition, the Verb Index links over 2,300 verbs to the verb conjugations. Online you will find a companion website that provides you with extensive bonus content--more than 100 exercises that give you a dynamic way to build your mastery of the French verb system. David M. Stillman, Ph.D. is a well-known writer of foreign language textbooks, multimedia courses, and reference books. He holds a Ph.D. in Spanish linguistics from the University of Illinois and taught at Harvard, Boston University, and Cornell. He is a professor at The College of New Jersey where he teaches Italian, Spanish, French, and Hebrew. Ronni L. Gordon, Ph.D. is a prominent author of foreign language textbooks, reference books, and materials for multimedia. She received her Ph.D. in Spanish language and Spanish and Latin American History and Literature from Rutgers University, and taught at Harvard and Boston University. She is an education consultant specializing in curriculum development in foreign languages, literature, and history, and teacher training.